Developed and built by Bluefin Robotics (Cambridge, Massachusetts), BPAUV is a small, fast underwater robot that maps the ocean bottom near the shore, detects changes in inshore conditions, and hunts mines. 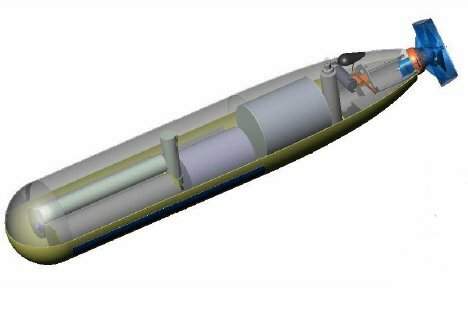 BPAUVs have a low-drag fairing with a single, articulated, ducted propeller. They can be operated from a ship or boat. They are routinely operated from oceanographic vessels without small boats, but can also be operated from a launch or even a small fishing boat. A behavior-based control architecture is used to provide flexible and powerful means of specifying mission objectives. A large and reliable library of behaviors has been established, and provides a tool kit from which missions can be constructed. BPAUVs are routinely operated as fully autonomous systems in which no communication occurs during a mission. BPAUV does not have an onboard identification or classification capability. The BPAUV weighs 800 pounds (1,000 wet), is 122 inches long, 21 inches wide, is powered by lithium polymer batteries and has an operational speed of 3 knots. The vehicle, once launched by crane from the mine warfare vessel, is an autonomous vehicle that travels on a preset course loaded into its program. With its side scan sonar, the BPAUV is able to detect and classify mine-like contacts in advance of the ship. In June 2003, ONR conducted a demonstration using BPAUV, aboard the USS Falcon (MHC 59). The demonstration was conducted over a two-week period in the Corpus Christi Operating Area. The crew of Falcon employed the BPAUV in several different mine warfare missions designed to demonstrate the feasibility of operating from a surface mine countermeasures (SMCM) platform and to evaluate increased mission effectiveness in terms of time and risk. By mid-2004 the Navy had four BPAUVs which cost about $750,000 each. BPAUV was among the first UUVs to be demonstrated on the Swift and was scheduled to conduct exercises off the coast of Norway and Norfolk, Virginia. USA Today reported on 6 May 2004, that the US Navy had lost the BPAUV off the coast of Norway during a military exercise called Blue Game 2004. The BPAUV failed to surface and return to the Swift and a week long search to recover the vehicle had failed to discover the BPAUV's location. On 11 May 2004, the Navy announced that the missing BPAUV had been found on a beach in Norway by an elderly couple walking on the beach. The local authorities notified relevant authorities and delivered it to a NATO facility. Reports indicated that Navy specialists believed that the problem was not a technical malfunction but was instead an operational mistake. Apparently, the BPAUV hit a freshwater layer when it was ballasted for saltier water.